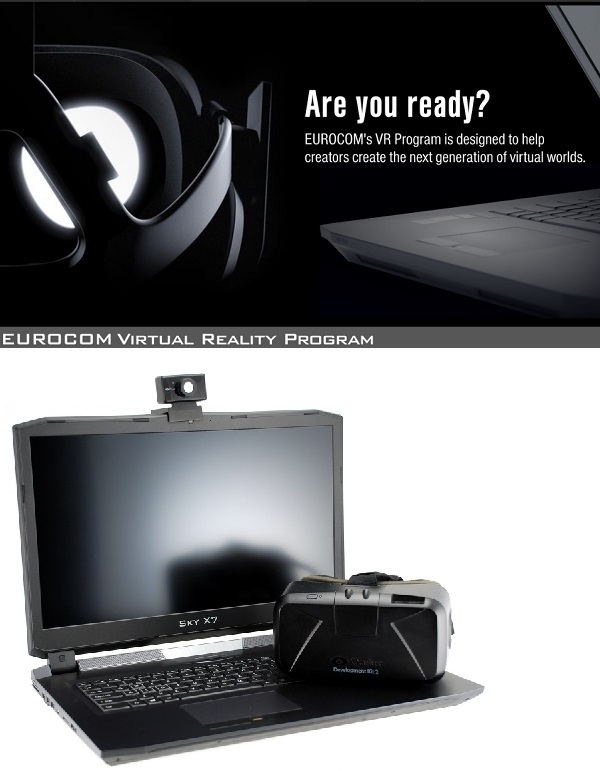 Eurocom is launching the VR Developer Program to assist those who are on the forefront of Virtual Reality development attain the high performance mobile hardware they need. Eurocom’s powerful Sky X9E and DLX7 laptops are state-or-the-art systems that go hand in hand with the latest VR headsets. If you need a new laptop to power the Rift or Vive, Eurocom is the best way to ensure you have everything you need. The EUROCOM Sky DLX7 and Sky X9E are VR ready because the high performance hardware within blows away the minimum specs needed to run the incredibly immersive experience and 360 degrees games and videos with an Oculus Rift of HTC Vive. The DLX7 and X9E Desktop Laptops support desktop Intel Core i7 processors in combination with NVIDIA GeForce GTX 980 desktop graphics and up to 64 GB DDR4 memory to allow for intensive usage such as VR development and testing. “VR requires serious hardware, and Eurocom delivers. Create your own mobile VR laboratory with e Eurocom VR Ready notebook like the DLX7 or Sky X9E.” Mark Bialic, Eurocom President. To qualify for the Eurocom VR Developer Program please send a one paragraph article outlining your work as a VR developer to along with links to your work, website or portfolio. Those chosen will be eligible for a 10% discount on the EUROCOM Sky X9E and DLX7. The EUROCOM Sky DLX7 takes advantage of an Intel Z170 chipset and socket LGA 1151 allowing support for desktop Intel Skylake processors up to Intel Core i7-6700K and an MXM slot allowing support for NVIDIA GeForce GTX 980 desktop graphics as well as four SODIMM for support of up to 64 GB of DDR4 memory, 4k 17.3” display and 5TB of storage via two M.2 drives and two HDD/SSD drives. “In a mobile 17.3” package, the EUROCOM Sky DLX7 allows users to carry desktop class performance with them anywhere on earth. Being fully upgradeable and customizable allows users to pick what components and technology they want inside the VR ready DLX7 powerhouse Desktop Laptop” Mark Bialic, Eurocom President. Five Terabytes of storage is possible through four storage drives for a plethora of capacity, configuration and upgrade options. Two 9.5 mm HDD or SSD bays and two M.2 SSD PCIe x4 SATA drives are supported with RAID 0/1/5/10 availability. EUROCOM Sky X9E is powered by desktop NVIDIA GeForce GTX 980 graphics, a fully unlocked GM204 core with 2048 CUDA cores. 8 GB memory with 7 Gbps memory clock and GDDR5 memory interface is supported. The EUROCOM Sky X9E is the first laptop with upgradeable desktop graphics supported inside, another amazing innovation from Eurocom. The NVIDIA GeForce GTX 980 is overclockable for maximum control and performance. VGA Technology: NVIDIA GeForce GTX 980 (N16E-GXX); 200W; 2x MXM slots.